Kotak bank has once again started intresting way of fund transfer " Mail Money service", you can send money to a beneficiary by just knowing his/her email ID and mobile number. You don't have to register beneficiaries. You don't need to know beneficiary's bank, account number, IFSC etc.Currently, this service is available on Kotak Net Banking Log in to Net Banking --> Banking --> Transfers and Payments -->Mail Money. You can cancel Transaction by using the 'Cancel Transaction' option in Internat Banking The transfer request can be cancelled till the time the funds are not debited from your account. Existing charges if applicable for NEFT/ IMPS will be levied as per General Schedule of Features and Charges (GSFC).You need to be registered for Net Banking with unconditional transaction rights. Service is available for individual customers only. Enter the beneficiary details like name, email ID, mobile number and payment amount. 2 OTPs will be generated and shared through SMS - one will be sent to you and the other to the beneficiary. The beneficiary will receive a mail from Kotak Mahindra Bank with the redemption link. 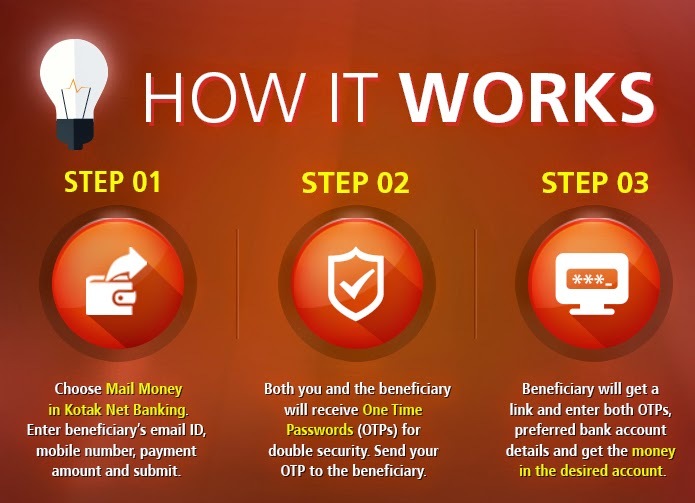 Beneficiary needs to enter both the OTPs and then enter his/her account details to receive the amount.OTP will expire 7 days from the payment date.You have the option to re-generate the OTP. A new link and OTP will be sent to your beneficiary email ID, along with a new OTP sent to you, which you need share with the beneficiary. Use the 'Re-generate OTP' option in Net Banking. A new link and new OTPs will be generated. The link will be emailed to the beneficiary on the email ID provided by you. After Beneficary recives link and OTP a beneficiary has to input the details for the bank account where he/she wishes to receive the money. The beneficiary account can be with any bank. Beneficiary will need to enter IFSC code, Bank Name, Bank account details and submit the request. Beneficiaries having a Kotak Bank account will only have to enter the Bank account details. The transfer request will be executed via fund transfer modes like NEFT/ IMPS.Funds will be debited from the remitters account as per the payment date requested by him. The transfer request will be executed via NEFT/ IMPS (Immediate Payment service). If the beneficiary bank participates in IMPS, the transfer will be executed immediately; otherwise it will be processed in the NEFT clearing cycle. The transfer is subject to sufficient balance in the debit account at the time of execution of request.